Version 1.9.0 of our flagship Magento extension, full page caching solution Evolved Caching has just been released. 1.9.0 marks the 12th release since version 1.8.0 and again a lot has changed. We have added support for a wider range of setups (for instance supporting installs in a subdirectory), added better and more complete admin notifications to improve usability, greatly increased the number of scenarios under which the cache is refreshed (for instance on a frontend sale, and when taking admin action like creating orders and credit memos) and implemented a number of other functionality improvements and minor bug fixes. 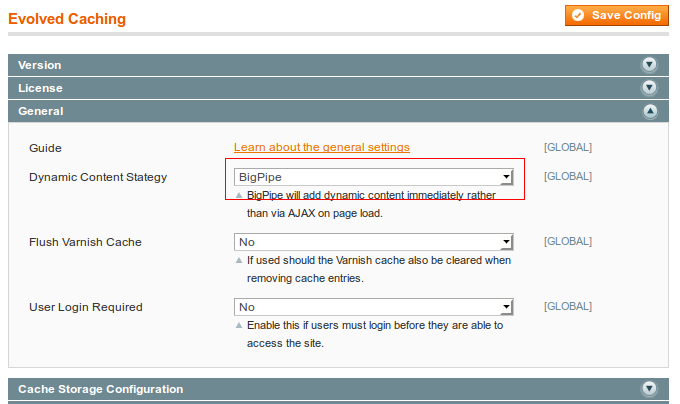 The most noteworthy addition to the extension however is the use of BigPipe technology, new to 1.9.0. This replaces the previous non AJAX dynamic content serving strategy and we believe Evolved Caching to be the first full page caching extension to implement it. This greatly improves performance when compared to the previous non AJAX strategy and means that now both AJAX and non AJAX methods are closely comparable in performance terms.